ww2dbaseKaname Harada was born in Nagano Prefecture, Japan in 1916. In 1929, he enrolled at the prestigious Nagano Junior High School (now Nagano High School). In 1933, he enlisted in the Japanese Navy and saw service aboard destroyer Ushio and carrier Hosho. In 1935, he began flight school training at Yokosuka, Japan. He graduated in 1937 at the top of his class of 35 students, and for that honor he was awarded a silver pocket watch by Emperor Showa. He first saw combat in China on 12 Dec 1937, and would participate in the Second Sino-Japanese War over the course of several tours of duty. In Sep 1941, he was recalled to Japan and was assigned to the air crew of fleet carrier Soryu. Flying from Soryu, he saw action over Pearl Harbor in US Territory of Hawaii, Wake Atoll, Darwin in Australia, in the Japanese carrier raid into the Indian Ocean, Midway Atoll, and Guadalcanal in the Solomon Islands. ww2dbaseOver Colombo, Ceylon during the Indian Ocean raid, he claimed 5 kills (3 would be confirmed). ww2dbaseAt the Battle of Midway, as part of the combat air patrol force, he shot down 5 US torpedo bombers attempt to attack the Japanese fleet, but others would get through, and as his fuel ran low, he found his mother ship Soryu aflame, thus opted to land on Hiryu. He was told that his fighter was too badly damaged to repair, and it would be pushed off the side, and the crew would take some time to prepare another fighter for him. While he waited, he went to the galley to grab whatever food he could find, and then rushed back, just in time to take delivery of his new fighter. Realizing that there were no more carriers for him to return to, he reached for his pistol to kill himself, only to find that he had left it somewhere on Hiryu. His initial attempt at suicide being foiled, his survival instinct took hold, and he safely landed in the water at 1535 hours Japan time, or 1935 hours Midway time, next to a destroyer, hoping it would mean a quick rescue, but a few moments later the destroyer was driven off by a number of US aircraft. Luckily for him, destroyer Makigumo would make another patrol in the area for downed airmen, and he was picked up. Aboard Makigumo, he recalled being overwhelmed by the large numbers of injured men, many burned, some moaning in pain, others yelling for their mothers. After returning to Japan, he was briefly quarantined at Kagoshima, Japan. ww2dbaseRecalled from service in the following month, Harada flew against the US attempt to capture the island of Guadalcanal in the Solomon Islands from the Japanese. On 17 Oct 1942, he was shot down by a US F4F Wildcat fighter. He survived the crash landing and the subsequent days-long trek through the thick jungle, and made it to a Japanese submarine base on the coast. The injuries sustained in this crash landing and the effects of malaria and dengue fever which he suffered in the jungle meant he would not see any further action. His score stood at 15 kills. ww2dbaseHarade served the remainder of the war as a flight instructor. After the war, Harada, he initially worked as a farmer and later, in 1964, established a kindergarten in his home prefecture of Nagano in Japan. He passed away in Nagano from multiple organ failures in May 2016. 11 Aug 1916 Kaname Harada was born in Asakawa village, Nagano Prefecture, Japan. 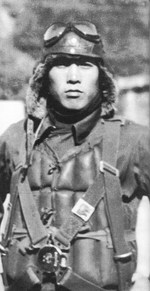 12 Dec 1937 Kaname Harada saw his first combat action in China. 31 Jul 1942 Kaname Harada was recalled from quarantine into service. 17 Oct 1942 Kaname Harada was shot down in combat over Guadalcanal, Solomon Islands, but he would survive his injuries and the trek through the jungle to reach a Japanese submarine base on the coast. 3 May 2016 Kaname Harada passed away from multiple organ failures in Nagano, Japan. My wife and I visited Harada-San and his family in Nagano in 1997. They treated us as "extended" family. Our connection is WWII aviation...the gold watch mentioned here is, indeed, beautiful. The kindergarten was marvelous...we were treated to a beautiful tea ceremony by a friend of the Haradas, who also was the foremost tea ceremony teacher in Japan. We will forever be indebted to the Haradas for one of the most memorable times in our lives during our visit to Nagano. I salute a noble person - selfless and obliging! Well done Sir......!